The 2009 Christmas season is looking to be off to a reasonable start with film scores. 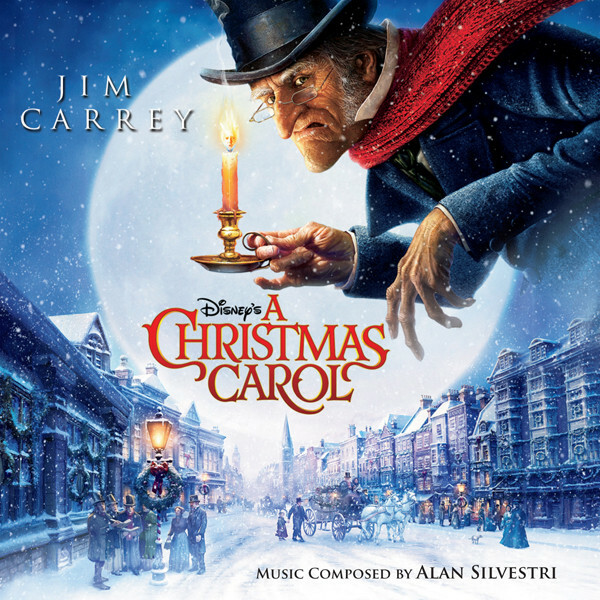 Alan Silvestri kicks things off with an enjoyable holiday score for the classic Dickens tale '”A Christmas Carol.' The story is, of course, about an old miser named Ebenezer Scrooge who seems to enjoy bringing financial misery upon anybody he can. He’s an old fool who looks at the world through cynical eyes. He especially hates Christmas time. So, on the night before Christmas Eve, his deceased business partner Marley decides to pay him a ghostly visit and seeks to save Scrooge from the same fate as became him (the chains of hell). Marley tells scrooge that he will be visited by three ghosts in the night, and sure enough, when Scrooge tries to sleep he is visited first by the ghost of Christmas past, then the ghost of Christmas present, and finally the ghost of Christmas future. 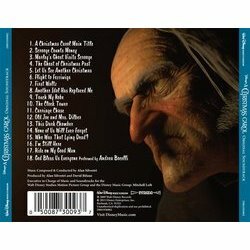 Each one of the ghosts takes Scrooge on a journey through his life, with each getting more and more depressing along the way. The ghost of Christmas past reminds Scrooge of when he became and why he is the way he is, valuing money above all else. The kingly ghost of Christmas present shows him the effects his life is having on people now, with equally depressing results. And finally, the ghost of Christmas future gives Scrooge a brutal wake up call as to what awaits him in the future if he doesn't change his life. So traumatized is Scrooge by the end of this experience that when he finally wakes up in his room all safe and sound on Christmas day he becomes intensely grateful for the life he has been given and goes through a major change of heart. He becomes a generous, giving, and endlessly happy man much to the surprise and delight of everybody in the town. Robert Zemeckis, unfortunately, took the tale to the digital 3D animated realm. From what I hear (not having seen it myself), the film is one which has glorious special effects and visuals but suffers as a whole because of the prevalence of said technical wizadry over the characters and story. However, as far as the music goes, Zemeckis made an obvious choice to go with his composer of choice Alan Silvestri. Many fans of the composer are probably still upset at how his score for “The Polar Express” was treated, getting only three tracks (including a basically satisfactory suite) on the main soundtrack and having no score release of its own. 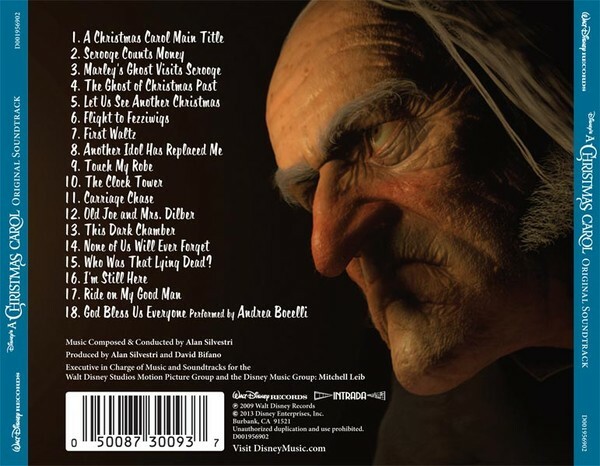 Such is obviously not the case here, as Disney has released around 42 minutes of Silvestri’s score for ‘A Christmas Carol’ with a song based upon the main theme tacked on at the end. On the issue of Disney's recent trend (started with the 'Up' soundtrack by Michael Giacchino) to release score-only albums as exclusively digital downloads, enough has already been said. It's an interesting trend, albeit one that has brought great grief on the film score community as a whole. Still, digital download is better than no music at all and we should be grateful for what we have. Silvestri has basically fashioned a big, bombastic symphony of traditional carols anchored by an insanely memorable main theme. 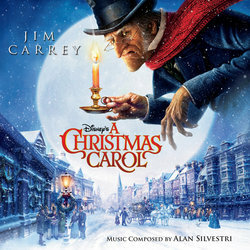 The main theme is simplistic yet true to the setting and tone of the Dickens tale while feeling appropriately Christmassy. Make no mistake, Silvestri has brought in all of the seasonal instruments and sounds to accompany his music here, complete with sleigh bells and choir. The result, however, is somewhat mixed at times. The score starts off wonderfully with a 4 minute montage of carols centered around Silvestri’s theme. Indeed, carols like “Deck the Halls”, “Joy to the World”, and “God Rest Ye Merry Gentlemen” all figure into the score at multiple points. The six-minute cue “Marley’s Ghost Visits Scrooge” is appropriately bombastic and scary sounding but is followed by the best track on the album. In “The Ghost of Christmas Past”, Silvestri blesses us with a magical mixture of orchestra and choir. The rendition of “O Come, All Ye Faithful” is soft and magical while the rest of the cue continues in like manner. The “Flight to Fezziwigs” is appropriately high flying but a bit too brassy for my tastes. I like my flight cues to be primarily string-based with the brass section used as backing. Silvestri here seems to use the two sections the other way around. “First Waltz” is another delightful track, but at a mere 60 seconds long is just too tragically short. “Touch my Robe”, which I’m guessing begins the Christmas present segment of the film, features a glorious rendition of the carol “Hark! The Herald Angels Sing” which is well worth a listen. “The Carriage Chase” is a frantic and exciting action cue centered around “God Rest Ye, Merry Gentlemen'. This cue, though, is part of and adds to a problem that the whole score suffers from. The score is big and bombastic, and unfortunately remains that way for too much of its running time. Silvestri is at his best here when scoring for the softer and more uplifting moments. While the action is generally exciting and well-written, there’s just too much bombast for my tastes which seems to reflect the film’s over-reliance on the afore-mentioned technical wizadry. The Christmas future sequence is appropriately down-beat and dark. “None of Us Will Ever Forget” is a lovely and somewhat sad piece which I assume highlights Tiny Tim’s future demise. “Who was that Lying Dead?” is the hellish culmination of the Scrooge’s travels through the future and hell. If this track were played alone, one might think it belongs to some gothic horror film. Things brighten up as Scrooge goes through his change of heart, and the final two cues of score round things out quite nicely (albeit briefly). The original piece “God Bless Us Every One” is sung by Andrea Bocelli. The man being the vocal powerhouse that he is, it seems that his voice was not the best choice for this song. The song would have been better served by a more traditional pop/rock singer in my humble opinion (even though Bocelli does have a great voice). It’s a pleasant enough track in its own right, but as with the main theme itself, it is nothing to write home about. Overall, the score is enjoyably pleasant with just enough highlights to warrant a recommendation from me. It’s appropriately Christmassy most of the time and while the integration of traditional carols all over the place might not have been the most original choice on Silvestri’s part, it is still highly enjoyable. You will also be whistling the main theme for long after you’ve listened to the score for the first time. The overly bombastic nature of much of the score and the lack of truely significant thematic material are the main points with which to bring against the score. Otherwise, it’s a pleasant enough album and a more-than-adequate introduction to the Christmas season. CD world premiere of bright, tuneful Alan Silvestri soundtrack for Robert Zemeckis 3-D computer animated motion capture filming of Charles Dickens novel for Walt Disney Pictures, featuring Jim Carrey, Gary Oldman, Bob Hoskins. Silvestri brings abundance of festive mood, rousing action, magic and more with music for large orchestra, full chorus. Original scoring melds with seasonal favorites in dazzling blend of fantasy and color. Disney/Intrada co-brand features same program as previously released 2009 download version, but finally makes it available in high quality CD format for collectors. Gorgeous packaging adds further appeal. Director Zemeckis and composer Silvestri have enjoyed a lengthy, highly successful teaming that resulted in Back To The Future, Romancing The Stone, Castaway, The Polar Express, Forrest Gump, many others. A Christmas Carol is another such highlight! Alan Silvestri conducts.